Over 5,000 marched with Rev. 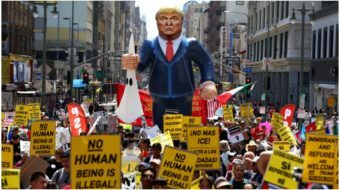 Jesse Jackson in Los Angeles, 4,000 rallied in Boston, 2,000 hit the streets in both San Francisco and New York, while Atlanta, Cleveland, Chicago, Minnesota, and the nation’s capital each saw a thousand protesters. The L.A. rally highlighted the case of the employees at China Daily News who still find themselves without union recognition despite the fact that 95 percent of the workers filed for representation with the CWA over three years ago. A Workers’ Rights Board hearing in the downtown Chicago Temple of the Methodist Church heard from Transport Security Administration worker William Stevens; Curtis Mills, fired from Comcast Cable giant; Eluteria Meson, a worker at Cintas’ Chicago area facility; and several of the 700 health care workers from the Resurrection Hospital chain trying to organize with AFSCME. In St. Louis, 100 supporters of organizing efforts at Trinity Cleaners got a first-hand view of the racist attitudes that workers at the city’s second largest non-union cleaners are up against. Doug and Greg Sansone, the company’s owners, told Local 50 SEIU representatives “Take your monkeys and go back to where you came from.” Organizer Mary Fox said Trinity has refused to allow the employees to unionize and the Sansones’ characterization of Local 50 members as monkeys exemplifies the racism at the company. Trinity has turned away African American workers seeking employment as part of a racist hiring policy, she said, while at the same time threatening its employees with losing their jobs if they speak to Local 50 representatives. 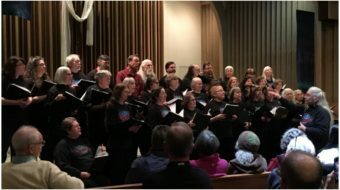 The Dec. 10 Human Rights Day commemoration is the last of a series of four activities in a “Season of Struggle” launched at the Jobs with Justice convention this summer. The season included a focus on health care issues, October’s cross-country Immigrant Workers Freedom Ride, and November’s anti-FTAA mobilization in Miami. Each of the campaigns deliberately reached beyond labor to its allies and potential allies, according to AFL-CIO National Field Representative Renaye Manley. The Human Rights Day activities are not the culmination but the kick-off of an on-going campaign to restore American workers’ rights to organize, she said. Legislation co-sponsored by Sen. Edward Kennedy (D-Mass.) and Rep. George Miller (D-Calif.), the Employee Free Choice Act, will streamline the union recognition process by providing for certification when a majority of employees sign authorization forms. The bill has already won support of 125 members of the House and Senate. Every one of the nine Democratic presidential candidates has called for this kind of “card check” recognition. When candidates Dennis Kucinich, Howard Dean and John Kerry joined several hundred workers at the New Hampshire AFL-CIO headquarters Dec. 10 at a rally to highlight local workers’ struggles to form unions, there was a victory, to celebrate, Television station WMUR had refused to negotiate with its workers even though they voted unanimously to unionize. Only after the Democratic candidates, in New Hampshire for the state’s early primary, made calls and wrote letters did the station back down and agree to recognize the workers’ union. Tony Pecinovsky, Denise Winebrenner Edwards, Jose Cruz and Gabe Falsetta contributed to this story.